As part of our commitment to excellence, Ochsner Volunteers provide an extra dimension of effective care and service to our patients, families, visitors and staff. Volunteers are an integral part of Ochsner's Service Excellence initiative. Their time and talents are vital to the comfort and care of our patients and their families. Ochsner volunteers have the satisfaction of knowing that even the smallest service can have far-reaching effects. Where would you like to help? 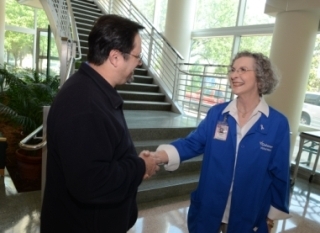 At Ochsner, we take the time to match each volunteer's interests and skills with departmental needs. Volunteers may choose from a varied choice of patient and non-patient care areas throughout the institution. If you or someone you know may be interested in providing help, hope and healing through their gift of caring, please call Ochsner's Volunteer Services Department at 504-842-5085. The Volunteer Application can be found here or in the Volunteer Services Office.